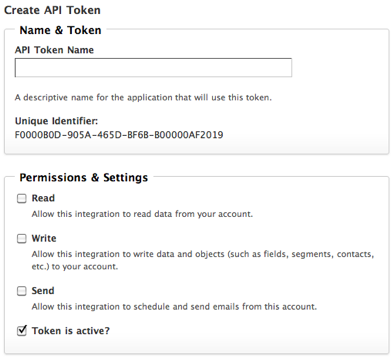 You can grant basic permissions (read, write, and send), as well as activate and deactivate specific tokens. Go to Settings > Platform Settings > Data Exchange. Specify a name for the token in the API Token Name text box. You should specify a descriptive name for the token. Read Access - Allow this token to read data from your account. Write Access - Allow this token to write data and objects (such as fields, segments, contacts, etc.) to your account. Send Access - Allow this token to schedule and send emails from this account. Click the Token is active checkbox if you want to activate the token at this time. You can always come back and activate the token at a later time.